Bohemian Rhapsody is celebrating more success after lead actor Rami Malek picked up another award over the weekend. 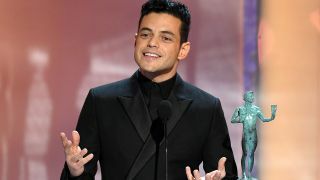 Malek, who previously scooped a Golden Globe for his portrayal of Queen icon Freddie Mercury in the smash hit film, won Outstanding Performance By A Male Actor In A Leading Role at the 25th annual Screen Actors Guild Awards in Los Angeles. Accepting the award, Malek said: “I thank Queen and Freddie Mercury. I get some power from him that is about stepping up and living your best life, being exactly who you want to be, and accomplishing everything you so desire. Bohemian Rhapsody has also been nominated for seven BAFTAs and five Oscars, with the film now the biggest music biopic of all time. It’ll launch on DVD, Blu-ray and on 4K digital on March 4 via 20th Century Fox Home Entertainment.